These cute cut off shorts look like they stepped out of the 70's but they're a little more stylish than the earlier version. Check out the printed on floral across one back patch pocket, the bits of distressed areas and the fringed leg openings. 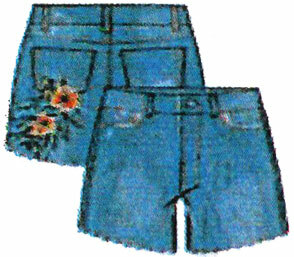 These have a real fly front and five pocket jeans styling. Cotton rich denim is real.